Ukraine Review 2019: Is Ukraine a Good Hosting? Since 2004, Ukraine has been providing SSD Shared hosting, VPS, and dedicated servers as well as international domain registration. Ukraine offers risk-free web hosting and scalable VPS and dedicated servers with the option to choose a server location worldwide. They privately own and operate a data center with hundreds of high-performance servers. Their website is in Russian only. Ukraine offers premium hosting plans with good functionality and stability. Five plans are available under shared web hosting. SSD Site plan is their basic plan. It comes with 1 GB storage space which can host just one website. With 5GB storage and 128MB memory limit, Best SSD plan is the other option. This is a good choice for customers who want to host up to five websites. If you’re looking for more storage space, you may want to consider the SSD Wizard and SSD Expert with 10GB storage each. You can comfortably host medium-sized websites or large website projects. Both plans also support unlimited sub-domains and unlimited mailboxes. With your hosting account, you also have the following features. In case you want freedom with configuration or better performance, you can go for their VPS hosting. They offer two plans; standard VPS and dedicated VDS. Using hardware virtualization XEN, their VPS allows you to leverage the power of modern processors. Basic Linux and Windows virtual dedicated servers come with 25GB SSD storage, 2GB RAM, 100MBps network connection speed, and 2.8Ghz CPU, and own IP-address. Scalable, you can add the number of resources that you need for your websites. Servers can be set up and configured within 10 minutes. You will get full root access to directories and resources via SSH. Windows hosting is available to customers who prefer to have dedicated hosting for their ASP.NET apps. To get one, simply place an order for a dedicated server with a licensed version of Microsoft OS. The cost depends on the number of physical cores and processors. With your license, you get your own IPs, 100GB storage space, access to DNS records, 5GB monthly bandwidth, and the privilege to host multiple domains. You can also get IP KVM on request. Ukraine has a refreshing and intuitive website. It looks much better than their older one. The user interface is user-friendly. With your own control panel, you can manage your web space conveniently. What I like about them is that they provide a suite with popular CMS’s and frameworks. Within minutes of signing up, you can set up and launch your WordPress site, forum, gallery, or PrestaShop e-store. Ukraine offers cheap hosting packages and flexible methods of payments. Looking at their plans, Linux is cheaper than Windows. Prices notwithstanding, you get five days to test their servers and hosting plans before you take your business online. When you order and pay for a VPS, your server will be deployed within 10 minutes. Shared hosting plans are deployed instantly. The good thing about Ukraine is that they back all their plans with a 30-day money back guarantee. I haven’t interacted much with their support team, but from what I have heard, they’re pleasant and helpful. Available 24/7, they can help you migrate your website, replace hardware that has failed, and configure your servers for optimal performance. You can reach them via email or phone if you’re in the UK or US or Europe. For quicker responses, I recommend their live chat service which is available in Russian and English. You don’t want to trouble support? You can find answers to a myriad of issues in their FAQs and knowledge base. They also have a good forum where you can bounce ideas or learn from the pros. 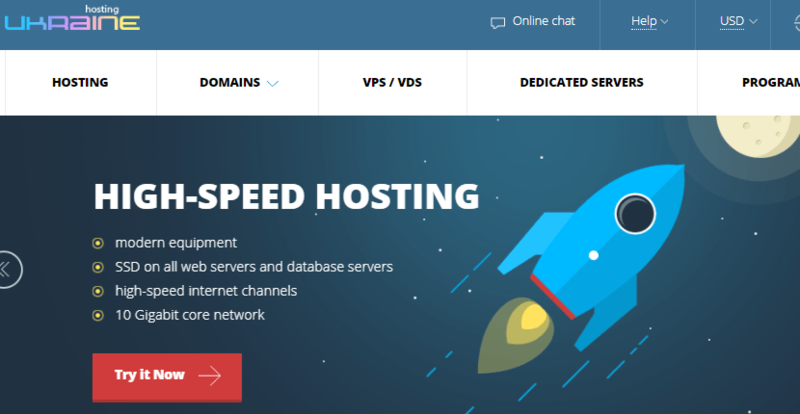 Ukraine.com.ua offers affordable and feature-rich web hosting for small websites and fast dedicated SSD servers for heavy projects backed by a 30-day money back guarantee. Wondering how Ukraine stacks up against other Web Hosting companies? Enter any other Web Hosting company and we will give you a side-by-side comparison.